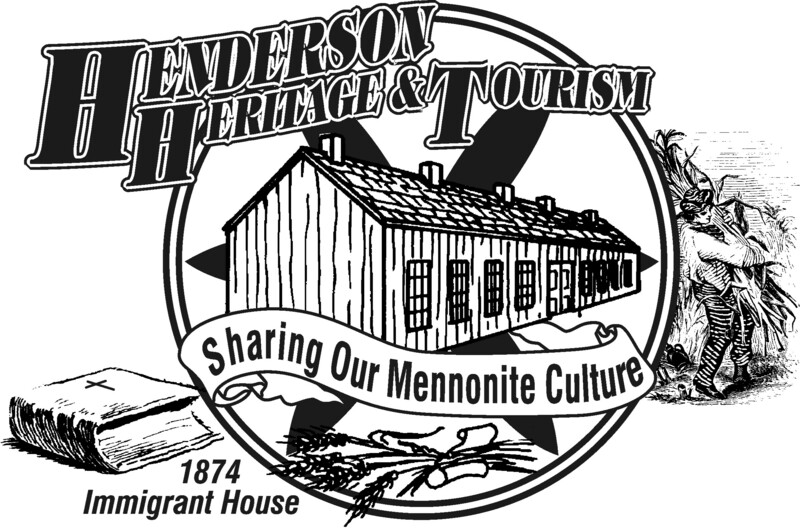 Henderson Heritage & Tourism was formed in 1994 with the purpose of sharing and documenting Henderson’s Mennonite heritage. In the spring of 1998 the committee purchased an 8 1/2 acre site that was homesteaded by Jacob & Anna Friesen, one of the original settlers, on the north edge of Henderson. Today this is the site of the Henderson Mennonite Heritage Park. The site located just north of Henderson includes a replica building of the original Immigrant House built by the Burlington Railroad that housed the first Mennonite settlers in the area. 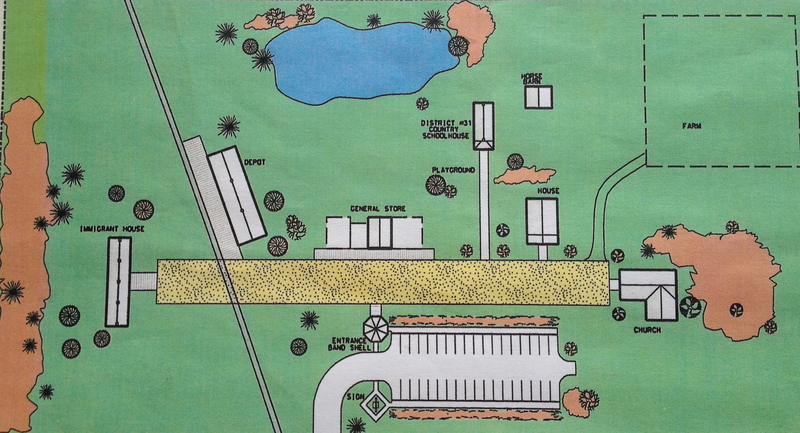 Lincoln architect Jim Dyck donated his services developing the site layout. Facing the Immigrant House at the opposite end of the park is the Country Mennonite Church built to resemble a typical country church that both branches of the Mennonites built in rural Henderson in the late 1800’s. The park also features a turn of the century farm house, summer kitchen, granary, outdoor oven, windmill, water tower, outhouses, chicken house and fully restored barn built in 1911. Nestled in the back corner of the park is a metal machine shed housing large pieces of equipment and a shop. The Visitor’s Center called The General Store is located on the Main Street at the park and is an air-conditioned and heated building with public restrooms, office, gift shop, basement storage and display area. The original District #73E Country School house is located at the park and is fully restored and available for school field trips and other educational activities. A replica building of the original Henderson railroad depot is filled with railroad artifacts, historical pictures and equipment. This is a very nice blog site. It should be better publicized! I just happened to stumble across it while looking for something else. I’m very proud of all the work that has gone into the Heritage Park to preserve Henderson’s Mennonitee history for our young people and the community-at-large. Is it possible to have a list of those first Mennonite families? Yes Karen. I will email this information to you. I would also love to see a copy of that list. I have requested the book “From Holland To Henderson” and I sent a check several weeks ago. The check has not been processed and I have no idea if the book will be on its way soon. Can you give me an update? My grandfather, John Regier, was born in Henderson. My husband and I are planning to drive through Henderson in March or April 2015. Is there a way to stop in and find out more about my family? Yes. You can call the following volunteers and they can meet you at the park. Marj at 402-723-5793 or LaVonne at 402-723-4559. Thanks for inquiring. The park is open from Memorial Day through Labor Day and all other times by appointment. Thank you! I will do that. We plan to drive through in April 2015. My father’s family came from Henderson. I would also like to know the names of the first families..
You can email lthiessen@mainstaycomm.net for this information. My ancestors came from Henderson too Johann and Agatha Enns (Hooge) he later Married Katharina PENNER after he was widowed. Let me say that once we were driving cross country and were in an accident and my wife ended up in the hospital in York across the highway. I didn’t know for the longest time why we felt the way we did while in that area but we hated to leave…years later I found out why when I realized that that’s where my ancestors settled. I bet I still have relatives around there. What a nice story. Stop by the park sometime and use our Grandma genealogy program to look up your relatives. My great great grandmother married a Johann Hooge after she was widowed. Her first married last name was Wiens. Her first husband died enroute to America when the were immigrating through Asia from Prussia. After arriving in Buhler Kansas she married Johann Hooge. Any thing sound familiar? We may be related. Hi! I enjoyed reading this site and it makes me want to visit. I originally looked Henderson up because I purchased a small pitcher with the name on the bottom in a circle with the word DART in the center. I like the shape and finish. Would anyone have more information on this piece? Thank you. These were made by a local company DART located in Henderson. We do sell some pottery at the gift shop at the Heritage park. Although, my relatives are not from Henderson, I believe there is a connection. I’ve been living in Nebraska for the last 15 years, and one of these days I’m going to make it down to your museum. My roots from my mother and father’s side came from the Ukraine colonies and settled around Hillsboro, ks in 1874. As far as we can go back (early 17th century) it appears my relatives were mostly mennonite. When they moved to Kansas they became Holdamen Mennonites. My parents were expelled and only 1 sibling I have joined, but she just recently left the church. I know that the scouts looked for land in Nebraska, Kansas, Dakotas and Canada for places to live, so I’m quite certain there is some common ground between us. Thank you for your information about Henderson, I have been reading about my background. My father, Elmer Victor Nachtigall was born in Henderson in 1915. I have never been to Nebraska, grew up in California and spent most of my life in Hawaii. I would very much like to visit my father’s birthplace some time. Is there a record of my family? My grandfather was Abraham Benjamin Nachtigall and my grandmother on that side was Lydia Heiser Nachtigall. My father, John Buller, was born in Henderson in 1914. He said his family (Buller/Friesen) was good friends with Nachtigalls. I bet our dads knew eachother! The Heritage Park has its own Visitors Center/General Store where many Mennonite related books, artwork, gifts and locally handmade items are sold. Local ethnic foods are also served at the General Store. In Henderson there is a local Farmers Market every Tuesday from 5 – 7 PM. Open Hours at the General Store at the park are Tuesday – Saturday from 1 – 4 PM. Thank you for such a great site and all of it’s information! My ancestors were part of the original (i believe..) 35 families that settled there in 1874. Peter Abrahams and Helena (Heinrichs) Abrahams came over from Molotschna on the Teutonia. Their daughter, Anna Abrahams, married my 3rd Great Grandfather Andreas Nachtigall (Great Grandfather to Mr. Paul Nachtigall above). Their son, Andrew, married Anna Fast whom I have had trouble locating very much information on save a few photos I have form my mother… If you have any information regarding the Nachtigalls, Abrahams, or Fast families that settled there I would be forever grateful to hear of it!! Thanks for your comments. We will get back to you about your request for information about your family! Anna Carey! I believe my great grandfather John P. Friesen came over in 1874 on the Teutonia!!! He was around 14? My great great great grandmother’s maiden name was Fast. Katharina Fast 1807–1844. Her father was Gerhard Fast and her mother was Helena Weib. Weib is questionable. I’m thinking Weibe or Wiens. I did find info on Gerhard Fast who was married to Helene Unger and on of their children was Anna Fast and she was born in the mid-1800s. Maybe your Anna and my Katherina are sisters or cousins? Book of memories by someone born and raised in Henderson: Prairie Lands, Private Landscapes by Lauren Friesen is now available on http://www.amazon.com. Where is the rock located that marks the place of the immigrant house. I have pictures of it taken with my children. I am 86 years old and was born in Henderson. I think I remember when the rock was placed there. My dad was David P. Friesen a long time teacher in Henderson public school. His parents were original settlers and lived in the immigrant house. Thanks for commenting on our website. The Memorial Stone is located one mile east of Henderson. Hi George & Adelina, do you know if there is anything like this available for those that settled in Canada? My Grandparents were born in Canada. I’m trying to find out about our History. My family, and Great Grandparents were the Mr. and Mrs. Henry Traut (Trout) who purchased Lot Three Block Five in 1893. I’m trying to locate where in Henderson this was located.. Any suggestions? Magdalena Traut, the wife, nee’ Burkhardt was widowed when Henry was shot in the back at a grain Silo….Anyone have info, I have a copy of the newspaper clipping. You have two different addresses listed and one is in error (according to my post office staff). It should be 720 Road B and not 702 Road B. Thanks for pointing that out Lauren. We will get that corrected. Tuesday - Saturday 1-4 P.M.
Heritage Park Epp Barn featured on 10/11 Pure Nebraska Great video interview of Robert Epp telling the story behind the barn at the Heritage Park.